Give yourself permission to be the person you were born to be. Bulk pricing available! Call Elizabeth for details at 605-310-5764. To get immediate access to special journal pages, Confidence Tools, and updates to the book, enter the first word in the quote at the bottom of page 51 in Confidence: Now is Your Time. How many times have you dreamed of making something great happen in your life? In your work? In your relationships? How often have you dismissed your vision for a better life as something unattainable? 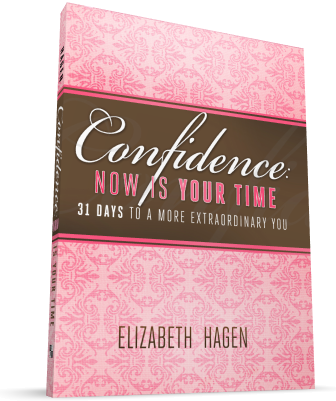 Speaker, author, business coach, organizing expert, mom, and wife, Elizabeth Hagen shares thirty-one stories that offer dramatic lessons she's learned to help you start loving who you are and what you do right now. You'll discover the peace and beauty of taking responsibility for where you are and who you want to become. You'll learn, as she did, how to give yourself permission to be the person you were born to be. Elizabeth offers inspirational and practical advice to help you take care of yourself, realize the incredible value you have to offer, and connect with others as they understand you and you understand them better. more productivity in everything you do. Now is your time to get this book. The rest of your life awaits!